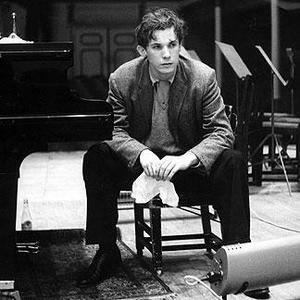 Glenn Gould (Toronto, Canada 1932-1982) was a canadian pianist most known for his interpretations of baroque keyboard music, particularly the works of Johann Sebastian Bach. Gould's first performance to receive widespread attention was his 1955 recording of Bach's Goldberg Variations. His speed, dexterity and tone revolutionized the understanding of this piece and it became inextricably linked with Gould for the remainder of his life. His final recording, in 1981, was also of the Goldberg Variations -- a much more studied and reflective interpretation of the work. Gould's first performance to receive widespread attention was his 1955 recording of Bach's Goldberg Variations. His speed, dexterity and tone revolutionized the understanding of this piece and it became inextricably linked with Gould for the remainder of his life. His final recording, in 1981, was also of the Goldberg Variations -- a much more studied and reflective interpretation of the work. Gould was also known for his uncommon views regarding the value of recorded performances vs. live performances (he stopped performing live in 1964), and regarding some canonical composers (particularly Mozart, whom he referred to as a 'mediocre composer'). Later in his life Gould also became known for his work as a radio documentarian with the Canadian Broadcasting Company (a statue of Gould can be found outside the CBC headquarters in Gould's hometown of Toronto).